Viewmount House is a beautiful Georgian house built in 1740 by the Cuffe family. Viewmount was inherited by Thomas Packenham (first Baron of Longford) when he married Elizabeth Cuffe, for the “what’s yours is mine” rule was in force when a man took a wife in those days. Viewmount has had various distinguished residents and in the late 19th Century was occupied by Harry McCann, a famed gardener who set the tone for future generations. Beryl and James Kearney have continued the gardening tradition, for the house today sits on four acres of magnificent gardens. It is an absolute oasis on the edge of Longford town where you can escape from the hurly burly of the real world and amble amongst the large old trees and orchard, the knot garden, herbaceous borders, Japanese or white garden. From the splendid red hall with open fire, you can’t but marvel at the fine elegant staircase which spirals up to big beautiful bedrooms and the drawingroom, very stylishly decorated and furnished with antiques. Beryl and James have also added 7 spacious suites and their long awaited VM Restaurant in the former stables with wonderful brickwork and luxurious stylish comfort is wowing people far and wide. There is a comfortable bar area where you can have an aperitif and take in the menu. They have an excellent chef and after you have enjoyed an amuse bouche you can continue feasting perhaps on pan roasted guinea fowl with apple, tarragon, wild mushroom and chicken farce, sweet potato puree and girolles sauce. Peking Duck with white truffle celeriac puree, game chips and anise orange sauce is another specialty. The menu changes but all the food is cooked and presented with style and individuality. Breakfast too is cracking, served in the fabulous vaulted diningroom and includes fruits and muesli, pancakes with maple syrup and pecan nuts, or scrambled eggs with smoked salmon… After you have fortified yourself you can visit the exquisite Belvedere House where Robert Rochfort imprisoned his wife Mary Molesworth for 31 years, and also see Ireland’s largest man made folly – The Jealous Wall. Nearby too is the beautiful Strokestown House with its famine museum. This is a perfect spot too for fisherfolk with Lough Gowna, Lough Ree and the River Shannon and it is right next door to Longford Golf Club. 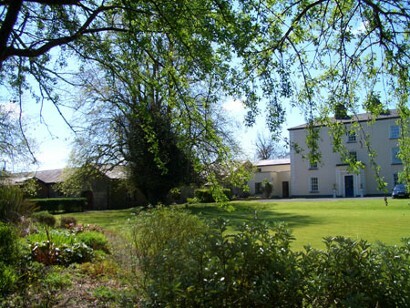 Viewmount is a delightful house to visit for a break or ideal for stopping over on the way to Donegal or the far West. James and Beryl are very friendly with a great sense of humour…you will enjoy the place.